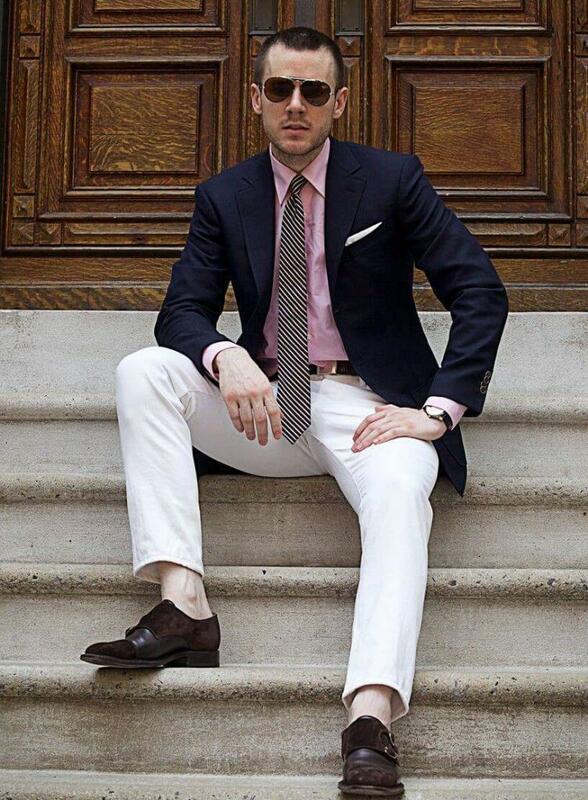 A white legwear has been around from years, but still climbing into a white trouser brings a number of doubts and fears. 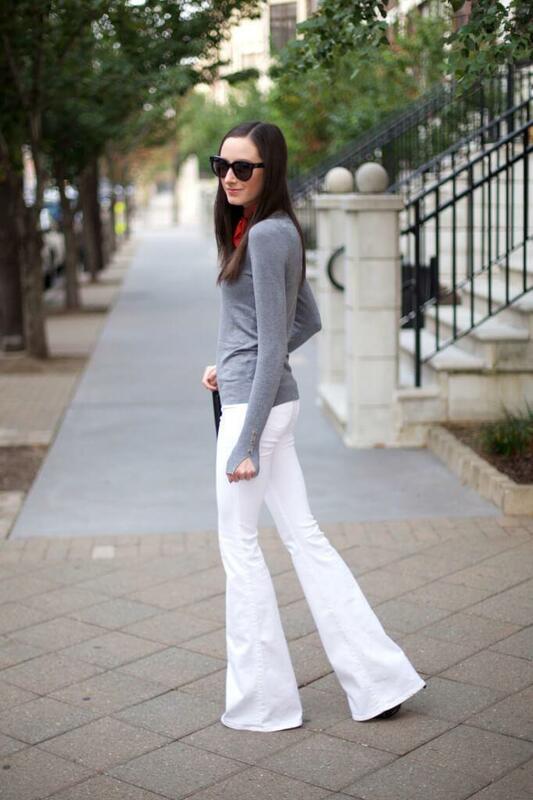 Can you look chic and stylish after wearing a white Jeans? The answer is ‘YES’. A white denim can be anything— a weekend fashion staple to an office staple. Both male and female can pull off a white bottom perfectly. All that is needed is to look for the best styles and cuts incorporated in best outfit ideas. Keep scrolling to find some of the best outfit inspirations for both genders. All the fashionistas out there, just take a look at the plethora of WHITES we have whittled down below. Incorporating these ideas in your everyday style is the real way to go. 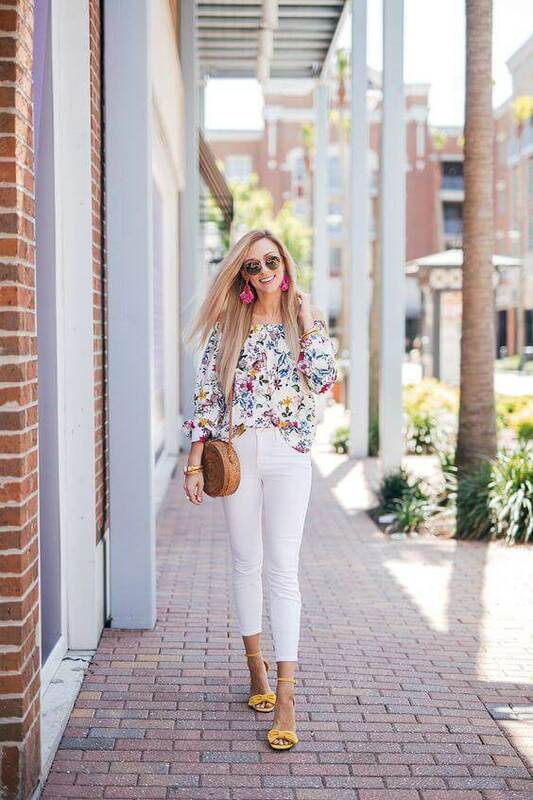 Petite girls who are around 5 feet and 3 inches or so, you can get the illusion of elongated height by trying high-waisted denim in white. Since white gives a plain bottom, opting for a printed and boldly hued top would be an innovative style. If it is about summer, go for a floral top; for colder months of the year, prefer something in stripes, polka dots or plaids. An all-white look never goes out of style. We all own staples like a white cardigan, white tee or a white blouse. Just get them teamed up with your white jeans of any style and look glamourous without putting much efforts. To add a flair of sassy style, handpick cropped white jeans with frayed edges. Pairing up with a tee and casual footwear would surely put you in the spotlight. Girls with slim body type must add a few white skinny jeans in their fashion wardrobe. Adorn your legs in skinny white bottom paired with some eye-catching tee or a denim top. This one is a perfect formal winter look. Be it your street style or an office attire, the combo of white jeans with well-tailored blazer is the style to look for. Wanna try a sophisticated and fashionable look at a time? Just team up your white jeans with a grey top (grey cardigan or grey trench coat). This one is an ideal combo for winter. When it is about the dull winter days, all that you need to uplift a boring look is a pair of preppy knee length boots. Hues like grey, brown or black should be preferred with a white bottom. Step out in style in skinny white denim paired with an army jacket. Addition of brown ankle boots help in maintaining a chicer style. Take a look at the images here to get some visual advice. The combo of white and pink always promises a soothing and romantic feel. So just team up your white bottom with sophisticated pink. Pairing it up with stiletto heels adds more to the romantic flair. Distressed denims are a popular urban style. It looks cool even in white. It promises a bold and fashion forward look. Pair it up with a denim top or any other blouse of your choice. We all have seen dashing males flaunting their bodies in white on the ramp. This hot trend can be experimented off the runway as well. 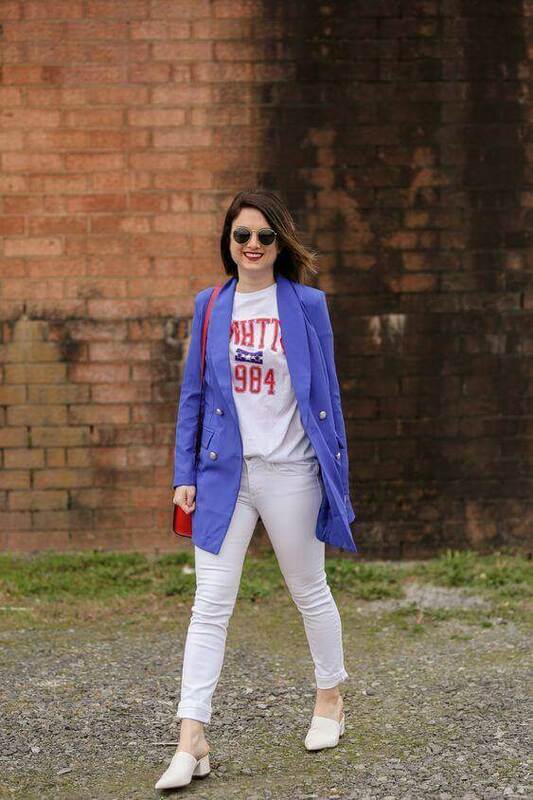 Just keep scrolling to get the best outfit ideas with white jeans. Summer is here and you all must have been planning some days off at some tropical lands. If that is your case, just pack your white jeans with some vibrantly hued Hawaiian shirt. 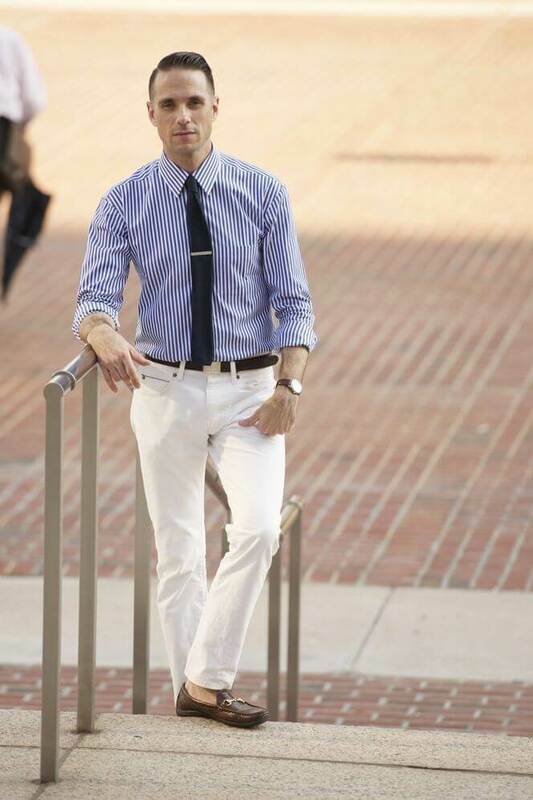 Get the most sophisticated look with white bottom paired with a navy-blue shirt. This catchy style can easily go from the office to after-hours. Even men can try a monochromatic look. 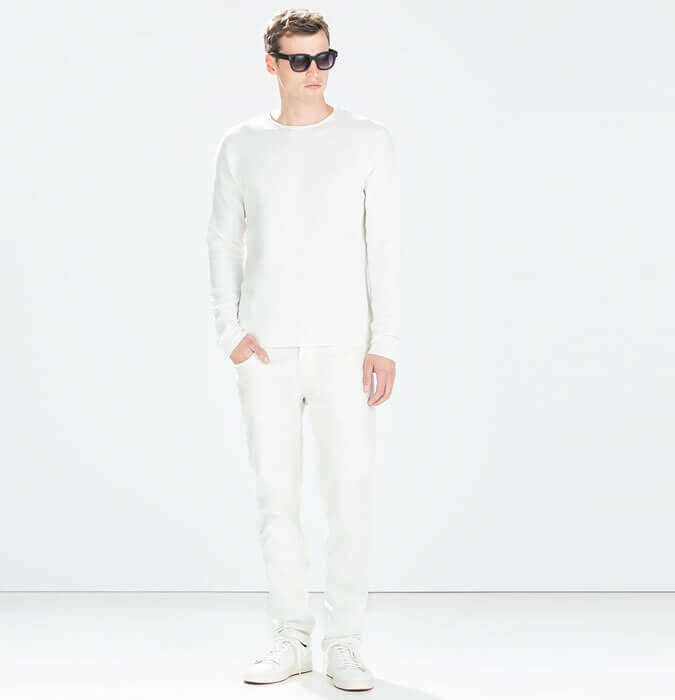 Chill out this summer in white from head to toe. Look for collarless shirts or a tee in crew neck style. 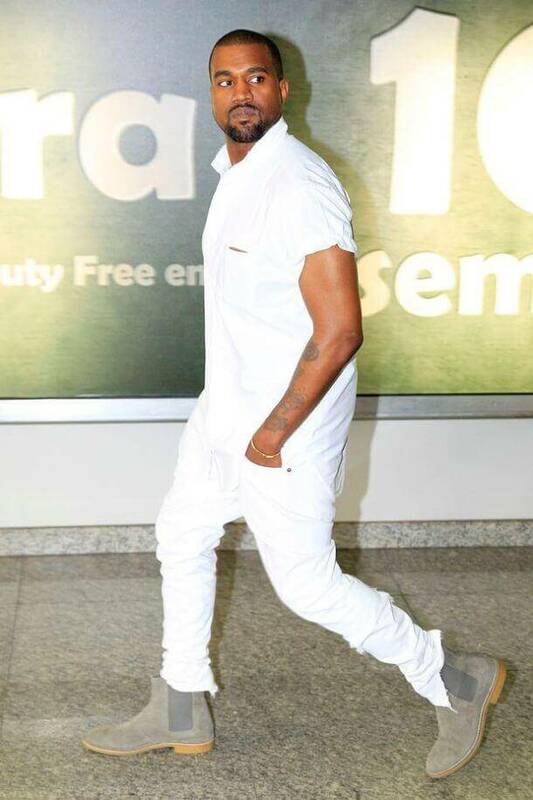 Check out Kanye West’s monochromatic look; to add a flair of style he has managed to wear grey Chelsea boots—they have just uplifted the whole look. For formal occasions like some party or even a wedding, teaming up of white jeans with a blazer can bring about the best results. This pairing would automatically give the look of a lightweight suit. 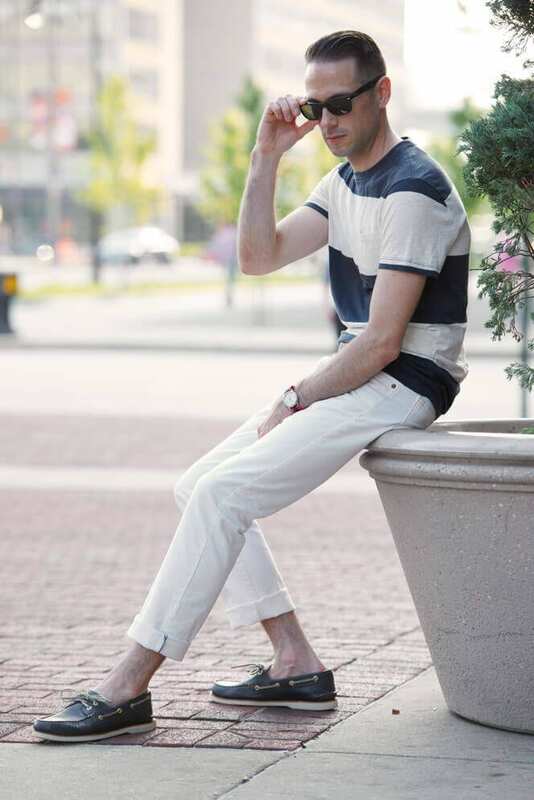 Take a look at this summer casual look. 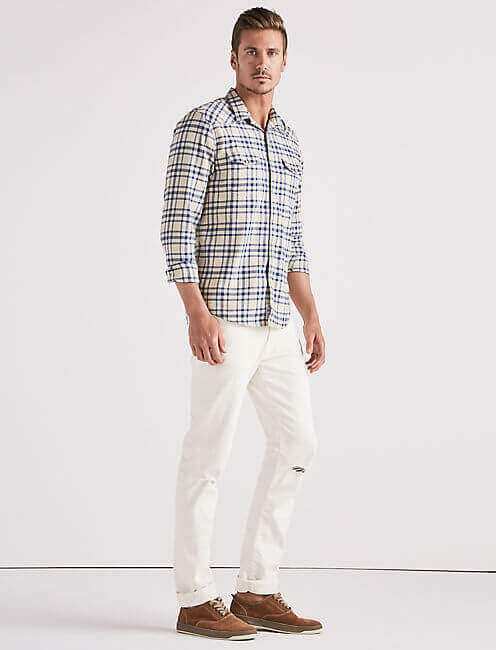 The combo of white bottom with button down shirt in plaids looks so stylish and easy on eyes. To complement the look, just opt for a pair of comfy sneakers—you are all set to get noticed. 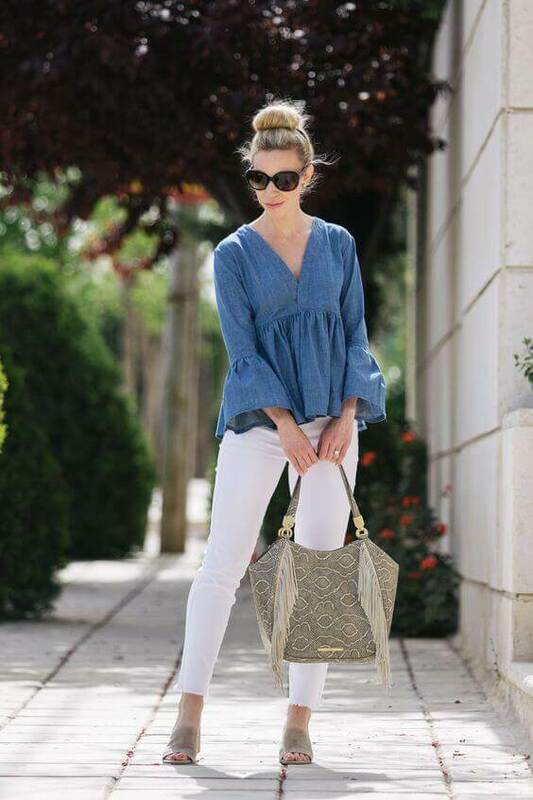 Trade your blue denim this summer with a white jean. Nothing could be better for those laid-back weekend days than teaming up your white denim with casual-looking tee and a pair of comfy shoes—to complement the look, do not forget your quality sunglasses. Normally an office attire gives the feeling of something dull and boring. And when it is about a hue like white, things get even more complicated. But looking at this visual advice reverts all the negative opinions. Pairing up of white denim with collard shirt, tie and a blazer promises an ideal look for working hours. Wanna get a super star-like street style in winter? Just go on with something like this. 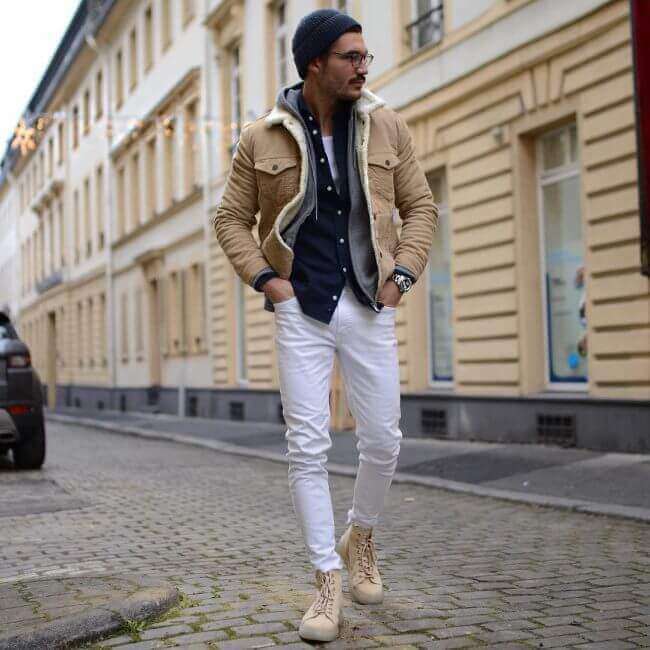 White jean gives an impressive look with a blue button-down shirt paired with a brown hoodie jacket. Light brown laced up shoes and a beanie cap are all that you need to seal the winter deal. 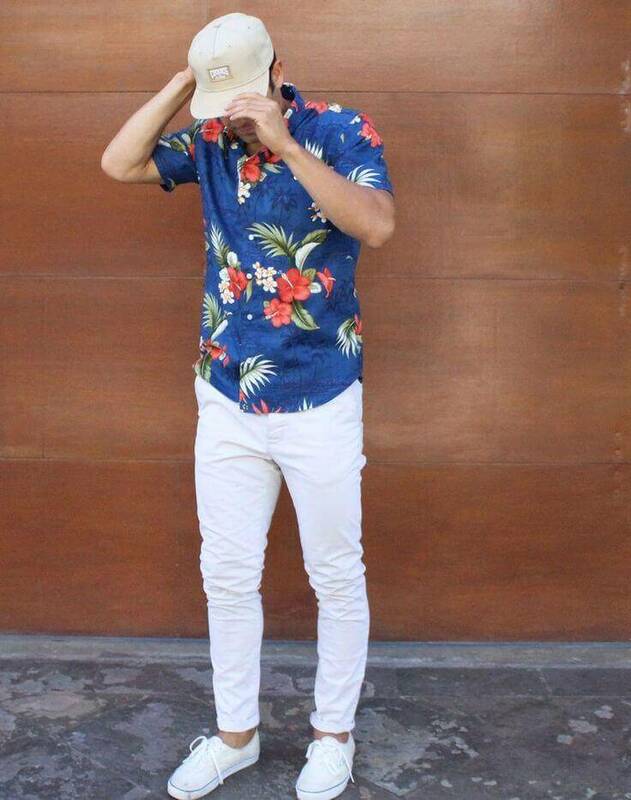 A pair of white jeans not just ensures amazing style; it is cool and unlike darker denim bottoms, it does not absorb heat and light, so these must be your choice in scorching heat of summer. Wearing white is a bit tricky; one wrong styling move, and you can ruin your whole look. Forgetting a tastefully styled and spruced up look, just stick to what we have broken down above. Next articleHow to Wear a Maxi Skirt Fashionably?